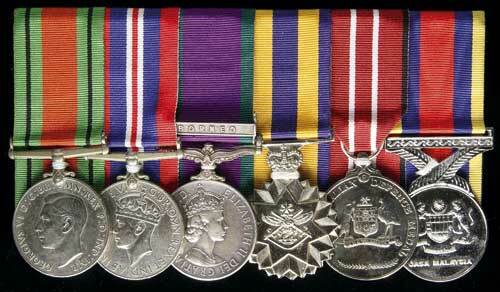 GROUP OF SIX: Defence Medal 1939-45; War Medal 1939-45; General Service Medal 1918-62 - clasp - Borneo; Defence Force Service Medal (EIIR); Australian Defence Medal; Malaysia Pinjat Jasa Medal. First, second and last medals unnamed, Sub Lt J.M.Riley R.N. on third medal, J.M.Riley R.A.N. on fourth medal, and E106860 J.M.Riley on fifth medal. Third medal impressed, fourth medal engraved, and fifth medal engraved, a renamed, official correction; also an additional single unnamed War Medal 1939-45. Group plus a single, very fine.